Experience the diverse cultures of Andalusia and Morrocco. From the charming city of Malaga to the mountain city of Ronda, you’ll be taking Mr Henderson’s Railway along the old smuggler’s trail. You’ll see stunning landscapes as the train rides up into the mountains, stopping off at quaint Pueblo Blancos (white villages). You’ll then take a train to Algeciras and a ferry from there to Tangier. This twin-centre itinerary will allow you to explore Africa and Europe by train. When you arrive at Malaga airport your driver will meet you and take you to your hotel. Malaga is the birthplace of Pablo Picasso, the most iconic artist of the last century. The city boasts a permanent Picasso museum where you can see many of his great works. Avoid the tourist traps and head into Old Town. Here you’ll see quaint winding streets and abundant tapas restaurants. We recommend the seafood: freshly caught sardines are particularly popular in Malaga. Later in the afternoon, take a trip to Alcazaba, a Moorish fortress that was built a thousand years ago. At the time, much of Southern Spain was ruled by the Moors. This fortress will give you a glimpse into a lost Medieval world. 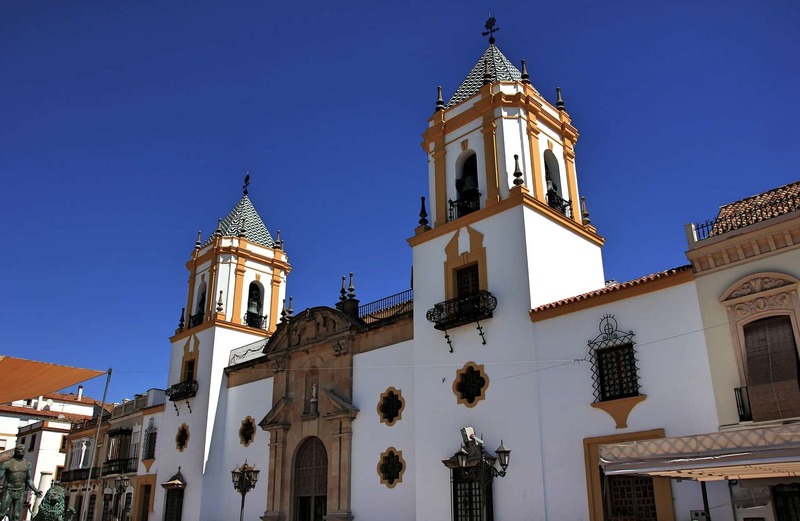 After breakfast take a direct train West to Ronda. You’ll be journeying high into the Ronda Mountains, with many eye-catching views along the way. Ronda is a dramatic city. Built on a gorge at an elevation of 2,500 ft, the city is divided between its new town and historic town by a bridge. Check into your hotel upon arrival, enjoy a refreshing drink and snack; then it’ll be time to explore. This city was a major stop off on the smuggler’s route, and a haven for bandits and thieves. It’s also the birthplace of bullfighting, Spain’s iconic and controversial national sport. Culturally, Ronda packs quite a punch. Orson Welles’ ashes were scattered here and Hemingway spent much of his time in the city. A tour guide will show you the major sites, including the 18th-century Plaza de Toros, one of the oldest bullfighting rings. You’ll see further glimpses of Moorish Spain, including the House of the Moorish King and Arabic hammams (water baths). As you wander around the mountain city you’ll be greeted by wonderful views wherever you look. You may even see eagles flying overhead. Built in the 1890s by British engineer John Morrison and financed by Sir Alexander Henderson, this train line is a fabulous Victorian relic. It was created to give British troops stationed in Gibraltar a link to the civilised world, this mountainous train ride was quite an impressive gift. You’ll be riding along the original single track railway. The departure times have hardly changed since the 1890s. From the Ronda mountains to Algeciras, this iconic train ride offers spectacular views. After a tapas lunch in Algeciras, you’ll take a ferry to Tangier. In just over an hour, you’ll have travelled from Europe to North Africa. You’ll be greeted by the bright lights of Tangier. Known as Europe’s gateway to Africa, Tangier was a big draw for gay artists in the twentieth century. Joe Orton, William Burroughs and Gore Vidal spent time here, attracted by its then lawless setup. This was a kind of no man’s land where gay people could live without fear of harassment. When you’ve checked into your hotel a tour guide will meet you and show you the sights, including Tangier’s vibrant music scene. You’ll hear the traditional Moroccan Jajouka music: its origins stretch back around 4000 years. You can also take a trip to the Cave of Hercules. This is where the Atlantic and the Mediterranean meet. In Greek myth this is also the place where Hercules rested after his twelve labours. Wake up bright and early for a five-hour train ride to Marrakech. It will be worth the trek! This iconic city offers great history and its bustling energy heralds a great future. Here you’ll find markets bursting at the seams with textiles, foods and more. Snake charmers perform, henna artists will try to tattoo you and yes, people will try and sell you stuff. That’s why we’ll be pairing you up with a tour guide who can disperse some of the more over-enthusiastic locals. Enjoy a hearty meal and then head to the Art Nouveau villa, Le Comptoir. Drink, relax, observe the local hipsters and then enjoy a belly dancing performance. You’ll have plenty of time to explore the bustling Medina market and Jardin Majorelle. This stunning garden was owned by Yves Saint Laurent; his ashes are scattered here. Foodies will do well in Marrakech. There are many great restaurants to choose from, such as Le Trou au Mur. You’ll take a train back to Tangier. From Tangier you’ll then take the ferry to Algeciras. Overnight in Algeciras for one more night of drink and tapas. In the morning you’ll transfer to Malaga airport for your return flight.